Hidden down a little alleyway, just a short stroll from Tower Bridge, is Wilton's - the world's oldest surviving Victorian music hall. And it is without doubt, one of my absolute favourite secret places in London. 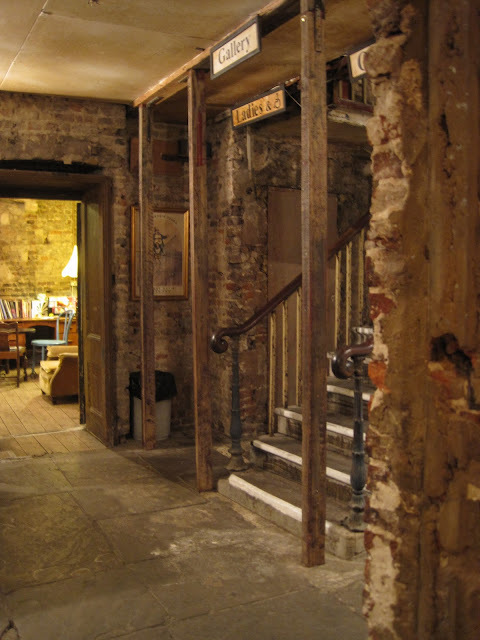 Opened by John Wilton in 1858, Wilton's is a historical and wonderful treasure. As well as playing the part of a grand music hall in its heyday, it was also used as a rag warehouse, a home for missionaries and a very welcome shelter during the war. In fact, it survived both World Wars and is so steeped in history, that its current delapidated and worn out state is instantly enchanting, and you can't help but be filled with curiousity and wonder as to what and who has frequented its very being in years gone by. The second floor is completely boarded up and not open to the public due to its precarious state, but The Wilton's Trust who now own the building, are raising funds towards getting Wilton's back to a safer state of repair and former glory, but hopefully without spoiling its derelict appeal. I first visited Wilton's a few years ago when I went to see a fantastic burlesque show, and instantly fell in love with the place and all its glorious, crumbling character. There's a lot to be said for exposed brickwork, old wooden floors and well worn flagstones. The feet of many a well-known actor, showgirl, musician and cabaret performer have undoubtedly trodden the boards at Wilton's. I recently returned and took a couple of friends for drinks to the fantastic Mahogany Bar which was built around 1725 and has been a public house ever since, although the rich mahogany features have sadly been stripped away over the years. 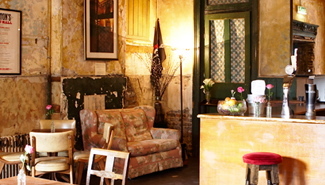 The bar alone is really amazing with such a warm and welcoming ambience. We found ourselves a cosy corner where we sat quaffing wine and beer, whilst losing ourselves in the atmosphere. The clientele are a real mixture including locals, musicians, workmen, curious wanderers who've simply stumbled upon it, and no doubt, the odd off-duty Beefeater! Being a Friday evening, it filled up quickly (it was cinema club night) and soon reached a crescendo of happy banter. Then out of nowhere, two people appeared with a large antique sideboard piled high with freshly made cheese and ham rolls for sale. The perfect accompaniment for a Wilton's glass of ale. If we weren't en route to dinner elsewhere, I am sure we could have quite happily whiled away the entire evening in the Mahogany Bar. The main hall is beautiful, despite its faded, derelict glamour, which in my eyes completely adds to its charm. You can totally imagine just how resplendent it would have been back in the day. 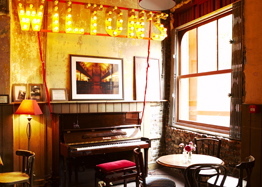 Even though it is only open during the week, there is a so much going on at Wilton's. Whether you want to attend a cabaret, magic show, guided tour, fashion lecture, ping-pong tournament, cinema club, classical concert or jazz evening, there truly is something for everyone. Even just partaking in a few drinks and a roll in the bar. Wilton's are always looking for volunteers, so if you'd like to get involved, give them a call. You can also become a friend or patron and do your bit to help. Check the website for upcoming events.